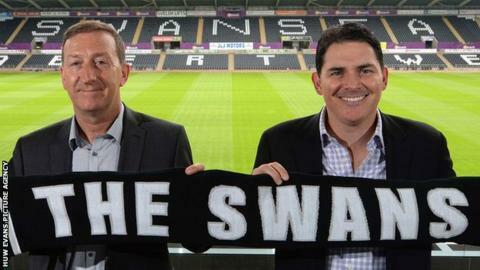 American businessman Jason Levien says his consortium has bought a 68% controlling stake in Swansea City. The group had been negotiating the acquisition of a 60% share, but the new figure was confirmed at a delayed media conference on Friday. Levien said funds would be made available for players, but investment would be "reasoned and measured". "We're not looking to make a splash at the expense of stability, consistency and sustainability," he said. "We want to make sure Huw [Jenkins, Swansea chairman] and the club have the resources necessary to succeed. We want to be strategic about it and thoughtful about it." "We're hoping to enhance what is already a strong football culture but helping to enhance that in ways where we think we can add value. "We're going to rely heavily on Huw. We wouldn't be making this investment without Huw's commitment to the club moving forward." Jenkins will stay in his role as chairman, while vice-chairman Leigh Dineen will also stay under the terms of the agreement which will have seen the American consortium spend around £75m on its controlling stake. Jenkins immediately announced the club were considering a bid for Liverpool's Wales midfielder Joe Allen. The Supporters Trust will keep its 21.1% share and remains unique in the Premier League in having a seat on the club's board of directors. However, it had claimed its members had not been consulted over the investment. "The Trust is a huge asset for the club and community. We see them as an important partner going forward. We've had in-person interaction with them on more than half a dozen occasions," said Levien. "I first came to visit about 11 months ago and I just started to connect with what they were doing here, and started to appreciate the investment in time and resources, the passion and energy of the Supporters Trust, the fans generally. "I thought it was a unique opportunity. The Premier League certainly is a unique opportunity but, above that, we think Swansea is a terrific fit for Steve [Kaplan, business partner] and I." The deal makes Swansea the sixth current Premier League team under American ownership. Levien says he and Kaplan, who lead the consortium, will be mindful to avoid the controversies of other foreign takeovers, such as Malaysian billionaire Vincent Tan's 2012 decision to change Cardiff City's kit from blue to red. "I'll tell you right now - we're unlikely to change the colours," said Levien. "I think there are lessons to be learned from all the different takeovers, especially international takeovers. "Steve and I have spent a considerable amount of time talking about best practices, talking with Huw about those practices." Levien is the managing general partner of Major League Soccer side DC United, while Kaplan is principal of Oaktree Capital investment fund and vice-chairman of NBA franchise Memphis Grizzlies. With an interest in both Swansea and DC United, Levien suggested the clubs could form a working relationship similar to Manchester City and affiliated club New York City. "I believe there will be opportunities for synergies. It was nice to have the squad at the practice field where DC United train last week [on Swansea's pre-season tour of America]," he added. "Where there are opportunities that are win-win and going to enhance what Swansea are doing, we're certainly going to look at those opportunities."